VANCOUVER, BC--(Marketwired - October 28, 2014) - Turquoise Hill Resources today filed an updated compliant independently-prepared technical report under National Instrument 43-101 - Standards of Disclosure of Mineral Projects ("NI 43-101") relating to the Oyu Tolgoi Project (the "Project"). Prepared by OreWin Pty Ltd, the 2014 Oyu Tolgoi Technical Report (2014 OTTR), updates the Oyu Tolgoi Technical Report dated March 25, 2013 (2013 OTTR). On September 22, 2014, Turquoise Hill announced that the 2014 Oyu Tolgoi Feasibility Study (the "Feasibility Study") had been finalized and presented to the Board of Directors of Oyu Tolgoi LLC. The Feasibility Study contains two production cases -- the 2014 Reserve Case and the 2014 Life of Mine (LOM) Case. The 2014 Reserve Case includes mineral reserves from the Southern Oyu Tolgoi open pit and the Hugo North Lift 1 block cave. Oyu Tolgoi's large resource base represents significant opportunities, not only as an exceptionally long-life project but also for production expansion. The potential development flexibility that exists with respect to later phases of Oyu Tolgoi will continue to be studied as part of the overall project strategy. Separate development decisions will need to be made based on future prevailing conditions and the experience obtained from developing and operating the initial phases of the Project. In August 2013, development of the underground mine was delayed to allow matters with the Government of Mongolia to be resolved. · An updated mineral resource model and estimate for the Hugo North deposit. The updated mineral resource estimate is similar to and confirms the previous estimates contained in the 2013 OTTR. 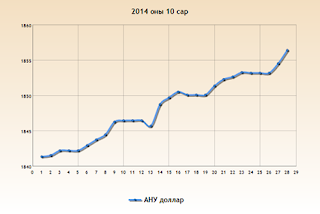 Mineral resource models for the other Oyu Tolgoi deposits have remained unchanged. · Updated mineral reserve estimates are broadly in line with previous estimates. The open pit allows for depletion from 2013 and modified underground dilution and mining loss assumptions resulting in lower grades and mining recovery. · Underground ore handling will be conveyed to surface via decline, which opens the Project to additional production flexibility and future optionality. The new mine plan will make use of the existing shafts and the planned shafts that were defined in the 2013 OTTR. · The reduced Project NPV is the result of delay (NPV8% US$0.8 billion) and a reduction due to more cautious cave performance assumptions, which led to a reduction in recovered metal and a slowing of ramp-up of the cave (NPV8% US$1.5 billion). · Underground block cave mine production remains at 95,000 tonnes per day. · The plant rate remains the current nominal 100,000 tonnes per day. · Expansion capital of US$4.9 billion for the underground project, which is in line with the US$5.1 billion estimate contained in the 2013 OTTR (excludes US$0.5 billion of capital spent in 2013 and 2014). For a non-renounceable entitlement issue of 1 Share for every 8.7 Shares held by those Shareholders registered at the Record Date at an issue price of $0.05 per Share, together with 1 free attaching listed Option for every 1 Share subscribed for and issued (New Option), to raise up to $1,516,421 (Offer). The Offer is fully underwritten by CPS Capital Group Pty Ltd (Underwriter). Refer to section 8.3.2 for details regarding the terms of the Underwriting Agreement. · Agreements entered into between Mongolia and China and Russia create significant opportunity for resource project development within both Mongolia and Russia, provide access to rail capacity and facilitate Mongolian seaborne exports. The 2014 financial year has been a busy and successful year for your Company. Some key highlights include the repositioning of the Company to focus on copper-gold porphyry projects in Mongolia, the completion of the company-transforming acquisition of the Kharmagtai copper-gold project, the restructuring and completion of the Oyut Ulaan project acquisition and exploration success at both of these projects. Xanadu also exited non–performing licenses, sold its Mongolian office property to release cash and realized significant administrative cost savings. The Company remains committed to Mongolia and the team is driven to deliver shareholder value through exploration and development success leading to a development plan. We have actively positioned your Company to focus on the copper-gold porphyry opportunity in the world class South Gobi copper belt. We have built strong foundations from which to advance the Kharmagtai and Oyut Ulaan projects. We entered the 2014 financial year having announced the amended acquisition terms for the Oyut Ulaan project and by early in the second quarter, had completed a trenching and drilling program that yielded multiple high-grade copper and gold intersections. These results highlight the potential of the project and we now have a number targets to follow-up. Oyut Ulaan is an earlier stage project but it does offer considerable exploration upside with only modest expenditure. In February 2014, the Company entered agreements with its joint venture company, Mongol Metals LLC, to acquire 90% of the Kharmagtai copper-gold project from Turquoise Hill Resources Ltd. This was a bold step for the Company, and management has shown great determination and perseverance to complete the acquisition, with shareholder approval received on 16 May, and with drilling commencing three weeks later. The drilling results have been excellent with significant extensions to known high-grade mineralisation at all three prospects. This program has added significantly to the project's scale with the discovery of a new mineralised tourmaline breccia zone with multiple intersections over 500 metres grading greater than 0.6% CuEq including a number of intersections over 200 metres grading greater than 1% CuEq. These results have been met with strong share market support. Kharmagtai is our flagship project and we are excited about the prospect of further exploration success leading to a development plan. We have made a conscious decision to stay committed to Mongolia. The South Gobi region has excellent geological potential and has the ingredients required for successful project development as demonstrated by the world class Oyu Tolgoi operations. The country also has a maturing regulatory environment and offers many comparative advantages over other emerging resources provinces. Mongolia has seen several positive changes over the last 12 months. A new Investment Law was introduced in November 2013 which provides for a stable fiscal regime and directly negotiated investment agreements. The state's minerals policy framework has also been further developed leading to the amendment of the 2006 Mining Law. We look upon these amendments as a very positive development as the Government moves to further generate international support for its mining sector. We are also drawn to the geography of the South Gobi region of Mongolia in particular. Not only is this region endowed with incredibly rich geological potential but, in contrast to many other emerging natural resources frontiers, it has established power and transport infrastructure, an experienced mining services sector, and topography that is conducive to open pit project development. It is also proximate to the high growth customer markets of north Asia. We have a strong presence in Mongolia and are supported by outstanding international exploration and support teams. Xanadu is supported by a very capable national team in Mongolia. This team is skilled in exploration, operations support, finance, administration and community relations. The results of their hard work is evident in what we have been able to accomplish over the past year. Our national team is a vital part of the Company and our continued success. Lastly, I would like to acknowledge the efforts of our Board, management team and all staff. 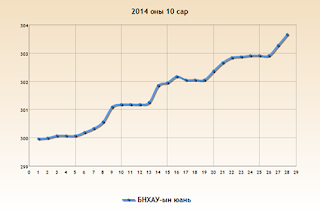 Xanada's strong performance in 2014, in what was generally a tough year for junior miners, is a result of the dedication and professionalism of our people. Thanks for all your contributions and as a team we have delivered exceptional exploration results. Ulaanbaatar, October 28 (MONTSAME) At the Stock Exchange trades on Tuesday, a total of 3,513 shares of 19 JSCs were traded costing MNT 14 million 938 thousand and 877.82. "APU" /1,520 units/, "Remicon" /417 units/, "Khasu Mandal" /397 units/, "Arig Gal" /204 units/ and "State Department Store" /92 units/ were the most actively traded in terms of trading volume, in terms of trading value were "APU" (MNT five million 631 thousand and 100), "Talkh Chikher" (MNT two million 381 thousand and 900), "Darkhan Nekhii" (MNT one million and 845 thousand), "Khasu Mandal" (MNT one million 627 thousand and 700) and "Mogoin Gol" (MNT 650 thousand and 650). The total market capitalization was set at MNT one trillion 557 billion 831 million 781 thousand and 87. The Index of Top-20 JSCs was 15,490.73, decreasing 45.10 units or 0.29% against the previous day. October 28 (Bank of Mongolia) On the Foreign Exchange Auction held on October 28th, 2014 the BOM has received bid offer of 40.0 million USD as closing rate of MNT 1854.00-1857.10 and 102.3 million CNY as closing rate of MNT 303.02-303.85 from local commercial banks. 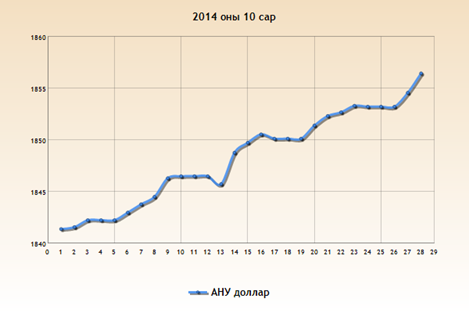 The BOM has sold 8.0 million USD as closing rate of MNT 1856.62 and 36.0 million CNY as closing rate of MNT 303.62. On October 28th, 2014, The BOM has received USD SWAP agreement ask offer of 30.0 million USD and MNT Swap agreement bid offer in equivalent to 70.2 million USD from local commercial banks and accepted all offer. October 26 (UB Post) The General Intelligence Agency (GIA) reported that the "secret" treaty publicized and said to have been established between the Democratic Party (DP) and Mongolian People's Revolutionary Party (MPRP) was generated by members of the Mongolian People's Party (MPP). The recent cooperation treaty established between the DP and MPRP has been controversial, with special concern arising over information about a "secret treaty" or appendix to the agreement. Head of the DP N.Altankhuyag made a statement last week claiming that the "secret treaty" did not exist and he would be pursuing an investigation of libel. Chairman of Public Affairs of the GIA, J.Buyandalai, confirmed in a press conference that a GIA investigation revealed that the secret treaty reported to have been established between the DP and MPRP was fake. The GIA investigation suggests that the document was generated by the Chairman in Charge of the Media and Public Relations department of the MPP, N.Demberel and other party officials. The investigation is ongoing. After the press conference given by the GIA, the MPP made a public statement at the State Palace. The MPP's Secretary-General, T.Gantulga, and attorney Radnaased participated in the press conference, saying, "On October 22, around 1:00 a.m investigators entered the MPP's central office and took the computer's hard drive. They investigated press agents of the MPP. The GIA is libeling people, it's not a private investigation bureau." They cited information from the report made by J.Buyandalai and said, "the above mentioned N.Demberel was working as the MPP's Head of Secretariat, but he was removed from the position." An un-official source reports that N.Demberel delivered his work on Thursday. MPP representatives state that the "secret" treaty was not created by its party. Moreover, they announced that the MPP will appeal to prosecutors and law enforcement for the publishing of libel against the MPP. News.mn spoke with MPP Secretary-General T.Gantulga about the report. Did your press agent report to the GIA that the secret treaty was made by the MPP? These are political orders. The GIA's investigators entered the MPP's headquarters without permission and confiscated the computer's hard drive. Moreover, they lied to the contract worker and took him to the GIA for interrogation. They also raided the press official's house and searched the property for many hours, but they didn't take any testimony from N.Demberel or any of the MPP's authorities. The investigators even told the contract worker to not say anything to the party's authorities. When and why did N.Demberel resign? He left his job at his own request. This is a human rights issue. It raises our suspicion that the investigators didn't take any testimony from him. The GIA is an organization investigating crime, but not the private investigation bureau of N.Altankhuyag. This is because the Head of the GIA is un-professional. According to the law, only cases which can't be delayed may be investigated in the middle of the night. October 26 (UB Post) After adopting a parliamentary draft resolution on measures for ensuring the realization of state policy on railway transportation, MPs and media focused on a scandal involving "flying messages", anonymous SMS texts sent with political messages. During the session on Friday, MP A.Bakei announced that there were some problems with telecommunications. He said that his ward members received rude messages from his number regarding the issue of railway transportation. "This is violating human rights, the rights of a legislator", he added. Speaker Z.Enkhbold added, "I received an SMS message from my own number. I tasked B.Ariunsan from the General Intelligence Agency (GIA) to investigate the issue, because it is a serious problem if it's possible to send messages acting as someone else." MP D.Gankhuyag added that he also received over one thousand messages since Thursday evening, reading, "Please vote 1. Chip borders with Chinese gauge, 2. Pledge Mongolia by Bank of China, 3. Sell our land to foreigners for 100 years." Messages with provocative content were sent to voters using MPs names and numbers, surprising and irritating message recipients. On Friday, PM N.Altankhuyag, Parliamentarian Special Sub-Committee Chairman G.Batkhuu and Chairman of the Cabinet Secretariat Ch.Saikhanbileg made statements regarding this incident. They reported that, MobiCom and Unitel tried to stop these messages, but people are still receiving them, so the companies sent messages to consumers warning them to be careful about the provocative messages. PM N.Altankhuyag announced that he tasked the authorities of the GIA, police, relevant legal institutions, the Telecommunications Regulatory Commission, MobiCom and Unitel to stop the messages and quickly find out where they were sent from and who was behind them. The Executive Director of MobiCom Corp., David Holliday, and Vice-Director M.Enkhsaikhan spoke to the press regarding the issue. MobiCom networking experts found that the anonymous SMS messages were sent from Romanian mobile phone network operator Vodafone, but messages sent by Unitel's numbers were sent from Malta. Currently, all telecommunications data from Malta and Romania to Mongolia have been restricted. David Holliday said that the illegal action with political intentions might have occurred by using faults in cell phone networks in Romania and Malta and computer programs rerouting the calls through Mongolian numbers. It was clarified that the messages were sent using 20 Mongolian telephone numbers, but it is not yet clear how many people received the messages. Engineers are working to determine what Romanian Vodafone number was used to send the messages and if they used Mongolian SIM cards or other devices. MobiCom did not accept the blame for the sending of messages and explained that the incident is similar to identity theft. October 26 (UB Post) American Nobel Laureate of Russian descent, Vasiliy Leontiev once compared the market economy to a ship, with government regulation as a rudder and human initiative and activity as the sails. If so, then 20 years after choosing the path of a market economy, Mongolia has lost its rudder and is now like a little ship being tossed about on great ocean waves. With macro-economic conditions at this level and an economic crisis looming, instead of implementing policies to increase private sector initiative and expand the tax base, the Prime Minister's proposal to restructure the Government is not only untimely, but it also draws the economic crisis closer, for it upsets several fragile balances. The internal power "wounds" of the Democratic Party were reopened due to his attempts to keep his post as the Prime Minister by making agreements with anyone, and any party, and finalizing the terms and responsibilities of the agreements. The double crisis of economics and governance is starting. The political parties have been unable to determine their fundamental ideologies and policies, such as the state's participation in the economy. Because there is no real difference between the ideologies of the parties, they all spread populist policies and widespread social welfare and decrease the competitiveness of the private sector, bringing the crisis closer. Due to the lack of clear concepts and operational principles, there is no internal unity or discipline within the parties and parties are slitting into factions based on mutual self-interest. Changing the Government structure, composition, or the Prime Minister today won't change public governance principles. Nothing will change until the current underlying issues of "double deels" in government are solved, the election commission is reformed by establishing a voter's commission, the accurate financial statements of political parties and elections are released, and the parties holding seats in Parliament are funded by the public budget. Therefore, the current Parliament has to pass laws that can address and solve these issues, and probably conduct a new election. Expanding Online Content for Mongolians: Interview with "Godfather of Internet"
October 28 (Mongolian Economy) Former parliament member D.Enkhbat—also known as Mongolia's 'godfather of the internet'—was the founder and CEO of Datacom, the first internet service provider to bring internet to the general population of Mongolia in the 1990s. In 2012, he declined an opportunity to stay in parliament, believing that the best way to affect positive change in Mongolia was through an ongoing campaign to expand online knowledge access into every Mongolian household. He is a current board member of the Open Knowledge and Open Education Fund, which is pioneering a network of online educational content for Mongolians of all ages. As the majority of online content is accessible only to English speakers, D. Enkhbat hopes to translate a wide variety of content into Mongolian, to add a new dimension to every Mongolian's opportunity to learn. How many Twitter followers do you have now? How well is social media developing in Mongolia? Very well. We have developed here to the point where we now underrate Facebook. Now it's time for us to move on to the next stage of internet development. What direction should Mongolia's development go in the internet era and Information Age? The development engine of the country is the skilled working force. The development of Mongolia is rated by its citizens' mind capacity. Foreigners see us in two ways—'Mine-golia' on the one hand, 'Mind-golia' on the other. Mining growth and mind capacity growth. How can we turn growth into development? We can compete internationally only when our three million Mongolians learn continuously for all their life to improve their skills, professionalism, and acquire high technologies, while keeping up the era's innovations. This country should be a nation with a culture of knowledge. We don't have the chance to educate people in their 40s, 50s or 60s with the current system. But the worldwide contemporary education system creates a condition where 7-year-old kids to 70-year-old seniors can learn. How can we build a continuously learning nation? There are two ways. One is to join the world culture, the wave of open knowledge and information that has spread worldwide. 70 percent of all software currently active in use is free. Thousands of people have been working and distributing to let others use them free. Many academics and scholars have gotten together to develop secondary school books, which are then made public to be used for free. There are books, scripts and movies. Some are not completely free, but are distributed through exchange. I am starting one project for Mongolians. I am going to hand out 50 training and operational videos to companies starting out in business. The company will take 49 movies in exchange for sponsoring one movie. 100 percent free knowledge, minus the price of one video. This is polite and open exchange based on partnership. The biggest example in the world of such a partnership and exchange is Wikipedia. If 80,000 people do Wikipedia, on the other side six billion people read and use it for free. This is the foremost successful project of its kind in the world. Mongolians need to take part in this open culture. There is also a second big model that can be installed in Mongolia. The world is functioning under an 'everybody give and take' principle. So now, how can we make that happen in Mongolia—joining together open knowledge and the education system—in terms of intelligence, technology, management, finance, the legal environment and international partnerships? Is that the reason you established the Open Knowledge and Education Fund? Yes, the main reason is that the integrated system for funding this work must be developed. We don't have an ownership form for partnering. Mongolia is working to create this kind of open ownership form. We have recently registered our fund. Although there are many problems in Mongolia, our fund is a good example of getting together to work hand in hand with government. Parliament approved our programme and designated it a government-sponsored programme for 15 years. Though a related law has not been passed, the state approved the programme and its financing.The programme involves King Academy, which has 4,000 videos that are all free. These are 15-minute videos of lessons in all subjects such as math and physics, and they are all in English. They are free to every kid in the world. Our fund signed a contract with this academy and obtained a license to translate them into Mongolian. Through the Ministry of Education, we have had support from select parliament members, and have the financing verified for an initial 1,000 movies to be translated. I have heard about the development of Wikipedia Mongolia. Tell me about it. We are working on the Wikipedia project designated to cataloguing Mongolian history, language, and culture. And we have made deal with Google to bring all services and software to Mongolian youth through a partnership. Furthermore, there are many more big works that we have already started and are on the way. What is your vision of Mongolia's future online? At the first stage of internet development, we needed to introduce and deliver the internet to all citizens. Now at this point we are starting the second phase of introducing Mongolians to the internet, which is delivering content and knowledge. Within 10 years, Mongolians will be supplied with 24-hour access to all online schools and online training. In other words, we are creating a wide-open, online Narantuul-style flea market. There is high demand for internet content. Mongolian youth need English, companies need computer skills. University students need different kinds of subjects, lectures and rehearsals, while both public servants and private companies need knowledge and advice. Modern people must be learning continuously. The four-year university can complement this need, possibly through an online education system. Other countries have already made a transition to this development. We are testing it in many different ways. The state needs to support this second phase of internet development that gives Mongolians better access to knowledge. After a while, the state's help won't be necessary. But in starting, activating and developing, we need the state to step in for support. The state should spend tax payer's money on what is most vital to its three million people. Politicians are supporting us because they do understand its importance now. This is not an issue to politicise, but an affair to work on together with great support. We need to have this mindset that we Mongolians must feed ourselves through knowledge. In order to make it happen, a person will face the need to recharge the battery or their brain all the time. But this environment where you can make changes and choices needs to be accessible to all. The problem today is that so much research and so many studies need to be done. Currently, the project is just at its starting point; some deals are signed with international partners, but much more needs to be done. Are you out of politics completely? Or are you still member of the Green Party? I had a choice: get reelected as a parliament member or move on and do a different thing. But I understood that Mongolia's problem is not in politics but in its way of thinking. Advancing the domestic development of the internet is much more significant and wide-reaching cause than taking a seat in parliament. I have made this choice because this will reform Mongolian culture. Now, I do not belong to any party. Recently, there has been a lot of talk about the development and formation of political parties. Is this happening because the development of the country depends on these political parties? Everything in the country has changed since 1990—except political parties, which have stayed the same as they were before. We have kept an outdated mechanism at the national level, in which vital issues go through political parties. And these parties are all very primitive. Whoever is more aggressive, richer, or talks more is the winner of any debate. Thus, Mongolian politics needs to transition out of emotional decision-making to responsible institutional decision-making. There were some years in the past when politics needed emotion. But today, we need to get rid of outdated methods, and move on to a high technology, science, knowledge and skilled workforce-based era. We need to tackle issues in healthier ways rather than talk about if they are democratic or not every four year election cycle. Those in charge should stop running the country with politics. How would you grade the performance of current Prime Minister Altankhuyag's government? I want to say that they did not use a very big opportunity. So much money came from mining when Mongolia had quite a good reputation. But they could not absorb it, and our reputation has been harmed. So, if what they've done is not enough, and they haven't received good marks on what they have managed to accomplished, then it's better to let them go. October 26 (UB Post) Executive Director of the Mongolia Oil Shale Association (MOSA) and distinguished economist Ch.Khashchuluun gave an interview about Mongolia's oil shale opportunities and potentials to grow. Mongolia's total oil shale reserve is estimated to be 700 billion tons. Is it accurate? Does Mongolia have internationally approved oil shale mines? The 700 billion tons of reserve is a pre-estimation calculated after four researches. Several works are being done for clarification. Foreign and domestic companies are actively exploring in central and eastern regions. Since legislations were approved just before Naadam Festival, exploration work is gaining momentum now. The pre-estimation will become an accurate number if exploration work is intensified from all sides in the future. This number is reasonable to a certain degree as the government researched oil shale reserve in the 1980's through special programs. There are two technologies for utilizing oil shale. One digs up a big hole like coal mining. The other is a suction technology used to extract liquid oil shade, similar to crude oil mining. Currently, verifying work for whether technologies are compatible, whether resource amount is able to reach investment amounts and etc. are being executed. Exploration intensified a bit in the last two years. Related law approvals became the gateway. I'm confident that Mongolia will reach certain outcomes through exploration. The MOSA is planning to do a survey nationally in Mongolia but no explorations. We discussed the integration of previous exploration work results with the Petroleum Authority of Mongolia. We can present it to the public if the government provides financial support. This will become a huge advance for attracting investors. The U.S. government studies world oil shale reserves annually. Two of Mongolia's reserves were recognized by them, namely one in Dornogovi Province and another in Dornod Province. Mongolian geologists are aware of reserves in Tuv, Khentii, Dornogovi, Dundgovi and Uvurkhangai Provinces. Dual exploration work has just begun. Currently, which companies are interested in investing? For oil shale, representative of France and the world's largest oil and gas company, Total S.A, have met and negotiated with Mongolia's Ministry of Mining several times. They expressed their interest to do a national oil shale study; basically to do exploration. Genie Oil has reached stages for exploration work. Mongolian companies are also doing explorations. Khuut deposit was recognized to have considerable amounts of reserves and was considered feasible for extraction. Western companies are interested in finding new deposits. Russian and Estonian businesses came to Mongolia and conveyed interests to cooperate on oil shale matters. Russia has been using oil shale since 1940 so they have excellent technologies and information. Russia was able to research Mongolian reserves very well in the 1940's. Estonia is rich in experience since they operate four power stations with oil shale. Since Mongolia has a lot of coal, we don't give much credit to oil shale but we should learn from Estonia's practice. We can't deny that it may be more productive and affordable. Genie Oil's technologies are more advantageous for petroleum and diesel production instead of oil shale. Their pilot plants are located in Israel and America. Associated Mongolian experts and officials and the Ministry of Mining probably visited the sites. Overall, Mongolia's getting many new opportunities. World countries started focusing on oil shale. China announced support of oil shale exploration and production. Mongolia even established a national institute for this sector. Genie Oil commented that oil from Mongolia's oil shale is as good as Arabian oil. Internationally, how good is Mongolian shale oil quality? Oil shale is a material similar to raw coal. The quality is assessed with the chemical product percentage ratio of soil and oil. A study was done for Khuut deposit and concluded to build a plant. Mongolian companies are interested in conducting this work. Genie Oil is highlighting outputs that contain petroleum product. Laboratory studies proved the deposit has high quality oil shale. Liquid parts are processed into petroleum and a bit heavier parts into diesel fuel. Experts said cars turn on immediately when heavier parts are infused. It seems that something amazing is about to happen. At the international investors' forum Oil and Oil Shale Mongolia 2014, held in Ulaanbaatar, many people highlighted oil shale as the most attractive sector for investors. Exactly how much investment can Mongolia get? Investors said that it's possible to attract three to four billion USD, meaning it's possible to get investments equivalent to the amount of Oyu Tolgoi's. Before pulling foreign investments, we must consider what product would come out of oil shale. Price of fuel imported from foreign countries cost almost a billion USD. Certain amount of this money can be kept in the country by utilizing oil shale. The second advantage is that it's a comparatively environment-friendly method. It doesn't need big pits and there will not be explosions. It will not be burnt after getting it above the surface. Thirdly, the nature will remain in its untouched state even when oil shale is used. Production will be done under 300 to 400 meters below the ground. Since there is abundant oil shale reserve, it can be used for various usages. Germans use it for materials used for building roofs. Mongolia can do the same. How oil shale is used depends on the private sector and government policy. It's possible to use it to operate power stations, make construction materials, or for fuel production. Mongolians throw away oil shale as garbage. There's a big pile of it beside Baganuur mine. That pile should be used for something beneficial. Mongolia should work towards providing fuel domestically. This will save an immense amount of money. Oyu Tolgoi's investment is said to be four billion USD. Mongolia imports fuel costing a billion USD annually. If oil shale is used as fuel, Mongolia will save more money than Oyu Tolgoi's investment within five years. Are there any legislation issues for countries interested in investing in oil shale? Investors are being careful. Since last year, the investment environment for mining sector has been improving. Two major laws were approved. First is the Petroleum Law. Every issue including how every type of energy source can be used, who can use it, and what will be monitored are specifically stated. Investors are able to know who they need to address, what procedures to follow for permission, and in what conditions permissions aren't granted. This is a big advantage. The second is the Investment Law. After discovering a deposit, you can mine it. Working conditions and tax environment has become specific. There are two articles investors are cautious on. In the article on royalty payment, it states five to 15 percent. It isn't clearly defined. Are there any issues for selling fuel? Sales are facing a set of issues. It's given that domestic fuel production will be supported with government policy for coal liquefaction, coal gasification and oil shale production. The uncertainty lies on what would happen if prices of petroleum and diesel coming in from foreign countries suddenly drop when Mongolia decides to sell [petroleum]. The state gets tons of things done after giving specific orders and large sum of funding. Later, they encounter issues concerning countermeasures if petroleum product prices suddenly dropped. This is a strong factor creating vague conditions for investors. The current price increase isn't good for the fuel sector. If prices decrease unreasonably it will become challenging for investors to estimate project revenue. 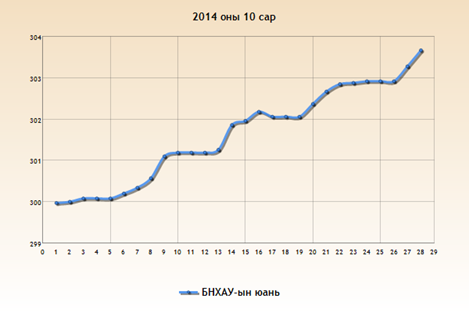 The Central Bank of Mongolia is executing the fuel price stabilization program. Some aspects are skeptical. A positive point is that it's stabilizing fuel price. If fuel price hadn't been stabilized, inflation would've reached 20 to 30 percent by now. It's crucial to continue preventing fuel price increase and keep it stable. In such circumstances, it'll be possible to make investment estimations and calculate its revenue. This condition will widen investment opportunities. You mentioned about actively working on using American and Chinese oil shale. Estonia burns its oil shale for energy and makes considerable revenue from oil shale exportation. Which other countries are focused on oil shale? Looking at the global approach, developing countries are making a lot of investments into oil shale. For example, Egypt and Jordan. Lately, Egypt has been working intensively on licensing oil shale deposits and establishing Use Agreements. Particularly, Arabian countries are paying a lot of attention to oil shale. Saudi Arabia is the world's dominant oil exporting country. They granted the first two oil shale licenses. They've begun allocating deposit fields. Oil reserves are nearing depletion. It's said that reserves will completely exhaust in 20 to 30 years. In response, these countries are trying to use oil shale. Egypt and Jordan originally don't have oil reserves. Israel has exceptional oil shale technologies and is beginning to build industries. The U.S. is utilizing oil shale and is working towards stopping oil shale exports by 2020. They've announced to completely supply fuel domestically. Poland and Germany has been contributing greatly to oil shale production and use since the 1940s. Estonia is a small country like Mongolia. Even so, it produces four times more energy than Mongolia. They produce energy with oil shale. Mongolia has massive amount of oil shale reserves. We are gradually working towards using oil shale development. Compared to two years ago, that understanding about oil shale has flourished considerably. Compared to a year ago, legislations have been adopted and legal environment has opened. At this rate, possibly in a few years, Mongolia will use petroleum and diesel produced from oil shale and no longer fear of running out of fuel. October 28 (infomongolia.com) The "World Trade Center Ulaanbaatar" NGO in association with Misheel Group is organizing the "Distributor Mongolia 2014" Exhibition at the Misheel Expo Center in Ulaanbaatar on November 07-09, 2014. There many entities are operating on Mongolia's import market as an authorized seller of foreign brands, but at the same time, some companies are importing authentic and counterfeit goods under certain brand names without a franchise rights. Therefore, this exhibition is aimed to regulate and introduce official distributor companies to local consumers that will be enabled to promote their goods and quality services. The Exhibition will be organized with supports of the Ministry of Finance, Mongolian National Chamber of Commerce and Industry, Intellectual Property Office, General Agency for Specialized Inspection, Agency for Standardization and Metrology, National Statistical Office, General Customs Office, and General Department of Taxation, and during the event, entrepreneurs, individuals and representatives of these organs will give comprehensive advices. MANAMA, Bahrain, October 28--(BUSINESS WIRE)--Round Table Pizza, an American pizza restaurant icon known for gourmet quality and fresh innovation announced the signing of an exclusive agreement with Al Mahroos Foods W.L.L. to develop restaurants in the GCC (excluding U.A.E.). The first restaurant location will be opening in Manama, Bahrain in the 4th Qtr. 2014, with additional restaurants expected to open in Bahrain and the wider the region throughout 2015. "Al Mahroos Foods has a reputation for valuing premium brands like Round Table Pizza," notes Round Table Pizza CEO Rob McCourt. "We are excited to work with such a partner and are confident of the road ahead." "We are proud to bring the great taste of Round Table Pizza to Bahrain and the region" said Mike Buck, Director International Operations for Round Table Pizza. "Our customers deserve Round Table's delicious west coast pizza made with the highest quality ingredients after years of compromising with discount brands." A team of management trainees just completed an 8 week training program in California that included the special skills required to make Round Table's famous pizza and all the components required to provide customers a superior experience. In addition to new restaurants in the GCC, Round Table Pizza is planning for the opening of a second restaurant in Mongolia and a restaurant in Ho Chi Minh City, Vietnam in 2015. October 28 (UB Post) Daily News was contacted about pharmacists going to court for selling the psychotropic drug Luminal, after an article was published about children suffering negative side effects, leading to a ban on Luminal production. Luminal is commonly used as a sedative, hypnotic, and anticonvulsant, but pharmacists were charged for trading Luminal and other drugs categorized as narcotics or psychotropic substances. The General Agency for Specialized Inspection of Mongolia (GASI) discovered that pharmacies in Chingeltei District, including Sulden and Noni pharmacies, were trading Luminal without a license two years ago. A pharmacist and retailer were prosecuted in accordance with Article 193 of the Criminal Code. A GASI file documents their repeated, illegal trade of Luminal at the pharmacy located in the 22nd building in Duchin Myangat settlement center of Chingeltei District. A state prosecutor charged them with selling Luminal without a special license and selling narcotics and psychotropic substances. At the time, nine pharmacies were permitted to sell these types of drugs in accordance with orders from the Head of the Capital City Health Department. Sulden and Noni pharmacies weren't included in the list of approved sellers. In the file, witness J.Enkhbayar, representing the Capital City Health Department, had stated, "Luminal is included in the List of Essential Medicines. Pharmacies must serve the public by providing medical prescriptions. Pharmacies can sell the psychotropic diazepam (a sedative), Apaurin and phenobarbital (Luminal), since they are used to treat various illnesses. Laws enforced in Mongolia contradict real life. A proposal was submitted to the parliament about this issue." While a judge claimed, "Licenses for trading narcotics and psychotropic substances weren't issued before, and not even now. However, they must have a special license for operating a business." Primary court dismissed the case against the pharmacist but convicted the retailer. Another GASI file showed that a Monos Pharmacy pharmacist was charged with the same crime earlier this year. Lawyers commented about drug manufacturers, pharmacy directors and pharmacists being investigated for illegally trading and selling psychotropic drugs. A source from one legal organization disclosed, "Article 193 of the Criminal Code states that pharmacists who sell psychotropic drugs will be held as associates in the crimes of illegally manufacturing, acquiring, storing, transporting, delivering or selling psychotropic and narcotic substances. According to the Criminal Code, this type of medicine must be traded with a special license. Yet, pharmacists and pharmacy directors are violating the law." The U.N. approved the List of Psychotropic Substances, which includes Luminal and sedatives, in 1971. The U.N. passed the List of Narcotic Drugs in 1961. Mongolia uses 12 substances listed on the List of Narcotic Drugs and 27 on the List of Psychotropic Substances. Lawyers explained that drug manufacturers and pharmacists are accused of crimes because some laws integrated the two different substances (narcotics and psychotropic substances) as one terminology, while others refer to the terms separately. Specifically, Article 3.1.6 of the Law on Medicine and Medical Devices classified that narcotics lead to addiction, while psychotropic substances affect the mind. The Law on Medicine and Medical Devices specifies that the lists of drugs classified in Mongolia as narcotics and psychotropic substances and their production, import, storage and trade regulations have to be approved by the Minister of Health. Resolution No. 400 of the Minister of Health, passed in 2011, namely the regulation on the production, import, and distribution of narcotic drugs and psychotropic substances, didn't specify pharmacies permitted to distribute psychotropic drugs and highlighted that public pharmacies can distribute these types of drugs. The regulation on narcotic drugs and psychotropic substances states that provincial and Ulaanbaatar health departments will determine the total number and location of pharmacies permitted to distribute these substances. In other words, laws and regulations about health, medicine and medical devices separate psychotropic drugs from narcotic drugs. In the Criminal Code, the two are integrated as one. This is implicating drug manufacturers and pharmacists in criminal activity. The Ulaanbaatar Specialized Inspection Authority conducts general inspections of pharmacies once every two years. A common violation discovered during these inspections is the unlicensed sales of psychotropic drugs and narcotics such as sedatives and Luminal. During the 2012 general inspections, more than ten violations occurred in each district, and pharmacists were investigated. Some were charged. A source reported that inspection agencies exposed several similar cases after the uproar about a child being poisoned by Luminal in early 2014. October 28 (infomongolia.com) Welcoming the 375th anniversary of founding the capital city of Mongolia, Mayor of Ulaanbaatar, Erdene BAT-UUL received in his office a guest of the celebrations from Ulan-Ude, Russia, Mayor Aleksandr Golkov on October 27, 2014. During the meeting Mayor A.Golkov expressed his gratitude for the invitation to participate in the anniversary event to mark on October 29th and said the City Administration is interested to host a UB Day in Ulan-Ude in 2015 and invited the UB Mayor E.Bat-Uul. Today, Mayor E.Bat-Uul received the Deputy Mayor of Miyakonojo city, Miyazaki Prefecture of Japan, Mr. Hironori Kodama, who is also invited to attend the UB celebration. At the meeting, parties focused on progressing cooperation in tourism and cultural spheres. Ulaanbaatar and Miyakonojo cities have a Sister City Relations since 1998. Moreover, dedicated to the 375th anniversary of Ulaanbaatar, postage stamps "The Capital City of Mongolia - The 375th Anniversary" designed by B.Damdinbazar were published and the presenting ceremony was held at the UB Administration on October 27, 2014. Ulaanbaatar, October 28 (MONTSAME) In a scope of the 375th anniversary of the UB city, here is visiting Derek Okubo, a director of Human Rights and Community Relations of the Governor's Office of Denver city of the USA. The UB Mayor E.Bat-Uul received his guest on October 29 to discuss ways of forwarding friendly relations of the two cities. Mr Bat-Uul thanked Okubo for accepting his invitation to the city's anniversary and requested him to train Ulaanbaatar administrative staff in Denver's Governor office for short-term internships. To this, Mr Okudo thanked the Mayor for the warm welcome and said he is ready to organize such trainings. The sides also agreed to develop a plan of cooperation in many fields. October 26 (UB Post) A new building for book retailers opened last Friday, designated for previously scattered bookselling stalls next to Lion Bridge. The booksellers used to operate in sub-standard conditions, until last year, when their businesses were temporarily halted by Ulaanbaatar administrators, awaiting the opening of the new building. Ulaanbaatar City Governor E.Bat-Uul provided 128 million MNT from the city budget for the building's construction completed by a domestic company. The building is 36 meters long and nine meters wide with 57 stalls. It was connected to central heating, water and electricity network lines five times faster than average, according to plans by the project's Mongolian engineer. A lighting system has been fully set up around the building, and shelving allows for standard book storage as well as retail conditions for the benefit of booksellers and customers. About 50 booksellers will resume their retail businesses in the building this week without paying any rental fees. They will be charged for only water, heating and electricity costs. October 28 (news.mn) A memorandum of understanding on establishing the Asian Infrastructure Investment Bank was signed by its participating countries in Beijing, China, on October 24th. A total of 22 Asian countries, including Bangladesh, Brunei, Cambodia, India, Indonesia, Kazakhstan, Kuwait, Laos, Malaysia, Mongolia, Myanmar, Nepal, Oman, Pakistan, the Republic of the Philippines, Qatar, China, Singapore, Sri Lanka, Thailand, Uzbekistan, and Vietnam, signed the memorandum of understanding (MoU) on establishing the Asian Infrastructure Investment Bank (AIIB). Ambassador Extraordinary and Plenipotentiary of Mongolia to China, Ts.Sukhbaatar signed the MoU, representing Mongolia. Regarding the signing of the AIIB memorandum of understanding, China's President Xi Jinping met delegations from its participating countries. Establishing the Asian Infrastructure Investment Bank is believed to be a significant push forward in regional development, creating a required capital resource for infrastructure development in developing countries, using the most effective ways to spend capital and expand it, as well as reducing capital outflow to foreign countries. The participating countries agreed to open the headquarters of Asian Infrastructure Investment Bank in Beijing, to start up in 2015. Ulaanbaatar, October 28 (MONTSAME) A third meeting of the intergovernmental working group of Mongolia and Germany on cooperation in Minerals, Industry and Technology sectors and a fourth meeting of the Economic Committee were held in Berlin on October 22-24. The working group's meeting was chaired by the vice minister of Mining and Energy of Mongolia D.Dorjpurev and the State Secretariat the Federal Ministry for Economic Affairs and Energy of Germany Matthias Machnig. Present were also a Mongolian chairman of Mongolia-Germany Economic Committee Ya.Batsuuri, the ambassador to Germany Ts.Bolor, the head of the department for management of policy implementation at the Ministry of Mining and Energy B.Batkhuu, the head of the department for the Strategy and Policy-Planning at the Ministry of Construction and Urban Development G.Mergenbayar and others. They presented a current state of the main development sectors of Mongolia such as Mining, Construction, Urban development, the Environment, and Science, as well of cooperation in these fields. The deputy director of the "GerMon Gas" LLC Monkhtuya introduced the activities of her company. Present from the German side were representatives of Federal Ministries for Economic Affairs and Energy, for Economic Cooperation and Development, for Foreign Affairs, and for the Environment, Nature Conservation, Building and Nuclear Safety, and the German chairman and members of Mongolia-Germany Economic Committee, along with representatives of the German Federal Enterprise for International Cooperation (GIZ), German Industrial Union, East-Asian Community of Germany, and "Germany Trade and Invest" organization. They informed the gathered about opportunities of cooperation and ongoing projects and programs. At the fourth meeting of the Mongolia-Germany Economic Committee on October 22, the business people and entrepreneurs introduced their activities and shared opinions on settling the challenges they face. Four sub-conferences were held on improving the value of Mongolian coal sector, cooperation in Expiring of raw materials and processing, Mongolia's infrastructure development, and Legal and Organization systems of cooperation. The participants were representatives of 120 organizations from Mongolia and Germany, including Erdenes MGL, MAK LLC, GerMon Gaz LLC, Shivee ovoo Ltd., MIAT Mongolian Airlines, Deutsche Bahn International, ThyssenKrupp, Siemens, RAG Mining Solutions GmbH, as well as other organizations for machinery, equipment and minerals and NGOs. The meetings discussed ways of intensifying cooperation in renewable energy sector, cooperation alternatives and experience sharing in solar energy and wind power technologies. The sides mentioned that in the past years, the training of Mongolian professionals has been prolonged and agreed to take decisive actions about this. Next meetings are settled to take place in Ulaanbaatar late June next year. Ulaanbaatar, October 28 (MONTSAME) Mongolia's General Electoral Committee (GEC) signed here the Memorandum of Understanding on Cooperation with Germany's Federal Election Committee on October 27. The document was inked by Mr Ch.Sodnomtseren, a chairman of the GEC, and by a head of Federal Election Committee Roderich Egeler. The parties intend to exchange experiences in the implementation of election laws and information on issues of election statistics. Mr Egeler said that such cooperation will become a model for electoral commissions of other countries and invited Mr Sodnomtseren to Germany. October 28 (infomongolia.com) The First Consultative Meeting between Mongolia, Russia and China at the Deputy Foreign Ministers level will be organized in Ulaanbaatar on October 30, 2014. At this Meeting, Mongolia will be headed by Deputy Minister of Foreign Affairs and Economic Cooperation Damba GANKHUYAG, the Russian Federation by Deputy Minister of Foreign Affairs Igor Vladimirovich Morgulov and the People's Republic of China by Vice Minister of Foreign Affairs Cheng Guoping respectively. In the frameworks, Deputy Foreign Ministers of Russia and China will be received by Acting Minister for Foreign Affairs and Economic Cooperation of Mongolia, Ch.Saikhanbileg. Before, the Tripartite Consultative Meeting between the Foreign Ministries of Mongolia, Russia and China used to organize at the Directorial-level of the affiliated territorial departments. Also, bilateral Consultative meetings at the Deputy Foreign Ministers level were held only between Mongolia-Russia and Mongolia-China. October 28 (news.mn) Speaker of Mongolian State Great Khural Z.Enkhbold met China's President Xi Jinping on October 27th. Speaker Z.Enkhbold said at the beginning of the meeting, "It's good to see you again as Mongolia and China are celebrating the 65th anniversary of establishing diplomatic relations. I want to deliver Mongolian President Ts.Elbegdorj's warm greetings to you. "Mongolia is satisfied with the results of your high ranking state visit to Mongolia in August, and the meeting of Mongolia, China, and Russia's leaders in Dushanbe. "I am pleased that bilateral relations between Mongolia and China have improved in all fields, and through regular reciprocal high ranking visits that develop political trust, mutual understanding is strengthened and bilateral relations have moved into the comprehensive strategic partnership level by the mutual efforts of both sides in recent years. "During your visit to Mongolia, a joint statement was signed to elevate Mongolia-China relations to a comprehensive strategic partnership. "I agree with your statement that Mongolia and China should be mutually friendly, good neighbors to each other, mutually beneficial good partners, and reciprocally visited good friends in your speech delivered to the ceremonial Mongolian parliament session. "Interparliamentary bilateral relations are an important area of bilateral relations. Bilateral exchanges and collaboration are intensified between the two parliaments and political parties of two countries. I am pleased that China accepts Mongolia's proposal to create regular mechanisms of cooperation between the Mongolian State Great Khural and National People's Congress of China, and signed a memorandum of understanding during this visit." Speaker Z.Enkhbold said that Mongolian coal miners have it harder as China has recently set a tax on coal import. The Speaker is seeking tax-free conditions on processed coal and steel products from Mongolia to China. Mongolia's coal makes up a large percentage of Mongolia and China's trade volume. But one of the largest coal users in the world, China, has set a tax on coal import, putting pressure on Mongolian coal miners. Thus, Mongolia is seeking tax-free conditions for Mongolian coal import for a certain period. The Speaker then expressed Mongolia's willingness to sign a long term agreement on synthetic gas export with Sinopec Corp. and expand cooperation with China's biggest entities to build a power plant based on a massive coal deposit in Mongolia, import energy to China, and expand currently available power plants. Adding, "An agreement is needed on energy import and export between Mongolia and China." In return China's leader said, "As you said, China will cooperate in supporting Mongo proposal for a coal gasification project and cooperation based on coal deposits. "Your proposal to build a processing plant to meet Ulaanbaatar's energy demands through the project of coal gasification, need to first be considered by related agencies of both countries, because it is seen as a project for the people of Mongolia." The Speaker then noted that Mongolia plans to launch two particular projects for the railway, road, natural gas, energy, and oil sectors in the framework of the "Steppe Road" initiative. Speaker Z.Enkhbold also suggested that China consider laying a gas pipeline in the western territory of Mongolia again. At the end of the meeting, Z.Enkhbold said that the Asia-Europe (ASEM) summit will be held in UIaanbaatar in 2016. And expressed thanks to China for its support on the issue. October 28 (infomongolia.com) Upon the invitation of the Chairman of the Standing Committee of the National People's Congress of the People's Republic of China, Mr. Zhang Dejiang, Mongolian delegates led by Speaker of the State Great Khural (Parliament) Mr. Zandaakhuu ENKHBOLD are conducting an official visit to Beijing on October 27-28, 2014. On the first day of visit, Speaker Z.Enkhbold called on the President of the PR of China Xi Jinping and at the beginning of meeting, President of China thanked the Speaker for paying an official visit and expressed his satisfaction on current reached relations between the two countries. At the beginning, Speaker of the Parliament Z.Enkhbold conveyed warm greetings of the President of Mongolia Ts.Elbegdorj to his counterpart and further noted that the recently amended China's legislation on setting taxation to coal import is causing heavy loss to Mongolian coal export companies, where the situation has not been normalized yet. Therefore, Speaker requested the President a temporary exemption from coal tax export for Mongolian entities until coal market conditions improve. Speaker Z.Enkhbold further said, "Mongolian side is interested to establish a long term agreement with Sinopec Corporation on exporting synthetic gas. Mongolia is willing to construct power plant relied on its mining deposits and export power to China, also, to collaborate with Chinese companies on expanding power plants in Mongolia. In order to do these, we should establish a general agreement on power export and import. Moreover, we have been proposing many years on putting gas pipelines between Russia and China through Mongolian territory. However, relevant Russian and Chinese entities have started to construct the "Far East" gas network and in this regard, Mongolia is asking again to consider on putting the "West Corridor" option through Mongolian territory, which will be economically beneficial and the most optimal solution". During the official visit of the President of China to Mongolia held in August 2014, several agreements and protocols were signed and thus, this visit is aimed to elevate the discussed issues into act. Furthermore, President Xi Jinping backed Mongolia's proposals to implement a joint project on coal deep processing plant in Ulaanbaatar that will help to reduce air pollution in the city and cooperation with Sinopec Corporation on coal gasification project. Also, Xi Jinping expressed his support to import goat and sheep meat from Mongolia and establish a general agreement on power export and import. At the meeting on behalf of Mongolian side, Deputy Chairperson of Mongolia-China Parliamentary Group Mrs. M.Batchimeg, members of Mongolia-China Parliamentary Group Mr. S.Byambatsogt, Mrs. S.Odontuya, and Mr. D.Sumiyabazar as well as Senior Advisor to the Speaker Mr. S.Lambaa, Ambassador Extraordinary and Plenipotentiary of Mongolia to the PR of China Mr. Ts.Sukhbaatar and Deputy Minister of Foreign Affairs and Economic Cooperation Mr. D.Gankhuyag were present. October 28 (infomongolia.com) On October 27, 2014, following the bilateral meeting with the President of the People's Republic of China, Speaker of the State Great Khural (Parliament) of Mongolia, Mr. Zandaakhuu ENKHBOLD held a meeting with the Chairman of the Standing Committee of the National People's Congress of the PR of China, Mr. Zhang Dejiang. At the meeting Speaker Z.Enkhbold noted, "We are now to sign a Memorandum of Understanding to establish a permanent partnership mechanism between the State Great Khural and the Standing Committee of the National People's Congress, which is considered an important fact as priority foreign policy of Mongolia to sustainably develop a long term relations with friendly neighbor of China. In this regard, we would like to express our gratitude to the Standing Committee of the National People's Congress for accepting our proposal". In turn, Chairman Zhang Dejiang said, "The China-Mongolia relation is one of the priority foreign policies of the Government of China to develop. The "Silk Road Economic Zone" proposed by China and the "Steppe Road" initiated by Mongolia are needed a careful studies on how to develop these two projects withal. In addition, an economic corridor to connect China, Mongolia and Russia is also required a narrow studies. By establishing MoU between the top legislative bodies of China and Mongolia, the relations between the two countries would cement cooperation and push forward bilateral ties up to a new stage". Following the meeting, Speaker Z.Enkhbold and Chairman Zhang Dejiang have inked the Memorandum of Understanding to establish a permanent partnership mechanism between the State Great Khural and the Standing Committee of the National People's Congress. By Mark Goleman, Doctor of Historical Sciences, senior researcher at the Institute of Oriental Studies of the Russian Academy of Sciences. October 27 (New Eastern Outlook) In 1994, the State Great Khural, Mongolia's supreme organ of government authority, adopted a foreign policy concept emphasizing development of good-neighborly, constructive relations with Russia and China as a priority for the foreign policy of Mongolia. Up to that point, Mongolian-Russian and Mongolian-Chinese relations had proceeded through several stages of development, experiencing both ups and downs. In the first decade following the establishment of the People's Republic of China, Beijing and especially Moscow proved to be a big help to Mongolia. China offered assistance in construction of residential areas in Ulan Bator, the broad iron-and-concrete bridge over the Tuul River, the Ulan Bator Hotel, the Central Department Store and so forth. The Soviet Union helped to build the city of Darkhan and the surrounding industrial complex, as well as put into operation the Erdenet copper mine, the Sharyngolvskiy coal mine and thermoelectric plants No. 3 and No. 4 in the capital, and more. Western analysts say that the reason underlying the generous amounts of aid that flowed from both countries during that period was the struggle between the Soviet Union and China for dominance in Mongolia. All of that lasted until the second half of the 1960s, when relations between Mongolia and China fell apart because of the confrontation that had arisen between China and the Soviet Union. Over the ensuing 20 years, the relationship between Mongolia and China was practically reduced to nil, not the least because Mao Zedong and his minions made no secret of their aspirations to make Mongolia part of China. Against this backdrop, over that time the Soviet Union remained Mongolia's primary sponsor and inspiration in "the cause of building socialism". A five-year trade agreement signed between Mongolia and China in 1986 initiated normalization and warming of political relations between the two countries, which was accompanied by a boost in trade and economic ties from 1990 to 1993. Eventually, it led to signing of a fundamental treaty on amicable relations and co-operation between Mongolia and China. The deal was signed on April 29, 1994 as a result of Chinese Premier Li Peng's visit to Ulan Bator. China adroitly took advantage of the decline in relations between Mongolia and Russia to enhance its standing on the Mongolian market. The period from 1993-94 to 2000 was characterized by full stabilization of relations between Russia and Mongolia and by advancement of China as Mongolia's major trading and economic partner. The beginning of the 21st century marked the onset of the current phase of Mongolia's relations with Russia and China, the key feature of this new phase being the transition from comprehensively growing bilateral cooperation to strategic partnership and advancement of an agenda aimed at establishing and enhancing the trilateral cooperation. Clearly, the necessary first step in that direction is for Russia, Mongolia and China to reach a consensus on the basic premises for such partnership. A special meeting held at the urging of Mongolian President Tsakhiagiin Elbegdor served those aims. Mr. Elbegdor met with Russian President Vladimir Putin and Chinese President Xi Jinping on September 12 during the 14th summit of the Shanghai Cooperation Organization in Dushanbe. For the first time in recent memory, the leaders of Mongolia, Russia and China got together and sat down at the negotiating table to share their views on Mr. Elbegdorj's offer to hold a trilateral summit in order to discuss the cooperation matters as well as the outlook for the broader cooperation and the security issues in northeast Asia. It stands to mention that the idea of holding the so-called three-party Ulan Bator Dialogue had been on Mr. Elbegdorj's mind for a while. The concept was ventilated in the recent negotiations with Xi Jinping during the Chinese president's state visit to Mongolia on August 21-22, and during Mr. Putin's working visit on September 3, 2014. Already back then the proposal received a warm welcome, and in Dushanbe the three leaders expressly voiced their complete approval of this initiative, hence making the Dushanbe meeting an important political mile stone. The Mongolian president offered three principles to serve as a basis for organizing the top-level trilateral summit: 1.) The three-party meeting shall be held once every three years, while the deputy foreign ministers of the three countries shall meet annually in Ulan Bator for the preparation of the summit 2.) The Ulan Bator Dialogue shall be open to the public and shall be congruent with the general principles of the trilateral partnership 3.) The summit shall address questions pertaining to the interests of all three parties, including transportation, infrastructure and regional issues. Reflecting Mongolia's vested interest in boosting rail shipments and construction of a gas pipeline from Russia to China across western Mongolia, special emphasis was placed on the potential for the country to bring in significant revenue from the transit. Taking the circumstances into account, Mr. Elbegdorj proposed that the three countries hold a work session this year in Ulan Bator for discussion and resolution of the above issues. He said that the work session would "jump-start cooperation not just among the three countries, but also in the whole region as well." Mr. Elbegdorj has made it obvious in his public remarks and his proposals that Mongolia is striving to play the leading role in the three-party dialogue, or a very active one in any case, and to be the nucleus of the trilateral negotiations. During the meeting in Dushanbe, Russia and China registered their attitude to the Mongolian proposal in statements by their respective leaders, and supported the idea of holding such a summit. Putin's words were "we believe that establishing an ongoing dialogue is an important, reasonable and valuable task". Xi Jinping expressed confidence that the three-way meeting "would provide a solid basis for development of closer relations between the three parties in the future." Among other matters, the leaders of Russia and China demonstrated their complete willingness to support Mongolia's membership bid to the Asia-Pacific Economic Cooperation group at the organization's summit in Beijing in November, 2014. However, there has been some disagreement on where and when the summit should be held. Mr. Putin's opinion was that the three-sided dialogue could be held at the annual summit of the Shanghai Cooperation Organization (the next summit of SCO is held in July 2015 in Ufa, the capital of Bashkortostan). Xi Jinping, in his turn, spoke in general terms of the importance of an initial three-sided meeting, without commenting on the time and venue for the meeting and without mentioning whether any further meetings are to be held after the initial one. In their public statements both leaders proposed some initiatives of their own on expanding the trilateral cooperation that could be discussed at the proposed summit. Among his other proposals Mr. Putin spoke of construction of a new railroad passing through parts of Russia, Mongolia and China; prospects for linking the Silk Route and the Steppe Route projects with certain Russian projects; installation of power lines across Mongolia. Xi Jinping noted, that the development strategies of the three countries coincide to a large degree. The Chinese initiative to create economic zones along the Silk Route was welcomed by Russia and Mongolia. There're prospects for integrating the Russia's initiative for building a trans-Eurasian mainline railway and the Mongolia's Steppe Route project, for creation of an economic corridor involving China, Russia and Mongolia. Among other proposals, Xi Jinping suggested that the three countries look into the feasibility of building a three-way cross-border electricity network. As evident from the above, amid the confrontation and conflicts pertaining currently in certain parts of the world, Mongolia, Russia and China have clearly chosen a course for improving their mutual relations for the sake of interests of all three countries. Given that, it is probable that the cooperation among the three countries in different areas will be raised to unprecedented heights. October 28 (WEF Blog) The Philippines and New Zealand are the best-performing countries in Asia and the Pacific in the rankings of the World Economic Forum's Global Gender Gap 2014 Report, published today, and the only two in the region to make the top 20 globally. In 2014, the Asia and the Pacific region has closed 66% of its overall gender gap; of the 18 countries in the region, 11 have improved their overall score, six have seen their score decreased and one has stayed the same compared to last year. The Philippines (9 out of 142 countries globally) is the only country in the region in the global top 10, ranking strongly for economic participation and wage equality. It has narrowed the education, health and survival gaps over the past year, and is the second-best country (just after Norway) on the ability of women to rise to positions of leadership in enterprise. The Philippines has the highest percentage of firms with female participation in ownership (69%). New Zealand (13) misses a place in the global top 10 for the first time this year. The country has closed its educational gender gap and is in the top 15 best-performing countries for the political empowerment of women. New Zealand was the first country where women received the right to vote, in 1893. Australia (24) has seen improvements in opportunities for economic participation for women, it is the second-best country globally on earnings equality, and the education gender gap has narrowed, but these improvements were slightly offset by a decrease in the political empowerment of women. Mongolia (42) ranks 10th in the world in equality of economic participation and opportunities, and has narrowed the gender gap on health and survival. It is the second-best country overall in perceptions of wage equality, and is the best country in the region for equality of access to professional and technical work. Singapore (59) ranks 18th globally for equality in economic participation and opportunity, and is the country with the lowest total fertility rate. Lao PDR (60) ranks fifth in the world for equality of labour force participation, and is 13th globally for equality of opportunity and participation in the economy. Thailand (61)has narrowed its gender gap on measures of health and survival, and ranks fourth in the world for perceived equality of wages. Thailand has, however, seen a significant decrease in the level of political empowerment for women. Bangladesh (68) this year posts its highest ever overall score in these rankings, having made important improvements to opportunities for economic participation for women, and gains in education and health. It is the best-performing country in the region on equality of primary education and is in the top 10 for secondary education. Bangladesh ranks poorly, however, for equality of representation in the legislature and in senior posts, although it has had a female head of state indicator for 21 years out of the past 50. Bangladesh is the second-highest ranking country for the percentage of women aged 15 to 19 in marriage. Vietnam(76) is among the three countries from the region scoring below average for equality of health and survival. It has the second-lowest ranking overall for a balanced gender ratio at birth, though this is partially offset by women having a healthy life expectancy. Sri Lanka (79) continues to make progress in closing the gender gap on health and survival, and has high involvement of women in tertiary education, ranking 13th in the world. There are few women in ministerial positions in parliament, but this is partially offset by the fact that the country has had a female head of state for 21 years out of the past 50. Author: Yasmina Bekhouche is a Project Manager on the World Economic Forum's Gender Parity Team. October 28 (UB Post) Schools that are not up to standards are closed and torn down in Ulaanbaatar, but the process of rebuilding and repair work is taking long, giving rise to many problems. For example, the students of School No.3 have been studying in different schools for three years because it was torn down for reconstruction. Furthermore, 50 school and kindergarten premises are registered as out of use buildings in the capital city. The State Professional Inspection Agency closed six schools due to outdated infrastructure: School No.3 and No.11 of Sukhbaatar District, School No.38 and No.73 of Bayangol District, School No.32 of Khan-Uul District and School No.14 of Bayanzurkh District. School No.3 and No.11 will be built through state funding, while four will be built through a concession. Authorities said that contractors of the projects will be announced within this year. The following are reports of schools that are operating in different building. Overall 1,000 students study at School No.73 and since they don't have their own building, students study in two different places. Students of the primary school, grades one to five, study at Gan Zam School No.20, while their secondary and high schools study at School No.51. This school has a dormitory because children from Tuul, Emeelt and Rashaant regions study there. Some students even study at the dormitory. The children of primary school study in three shifts. After the second shifts finishes the third shift, study in a room with no air circulation. The third shift classes finish at 19:30 which is a difficult condition for younger children. Since the library is not working children are not able to read new books, said the school's librarian. The following is an interview with the teacher of class 5B of School No.73, D.Tuvshinjargal. When will the school's reconstruction begin? Do you have any information? We get information about the school only from our director and he says that the contractor has been announced but we don't know the reason why it's taking that long [to start the construction]. The new school was planned to be commissioned by the first of September of next year. I think it is not possible. Some parents say that the land is going to be sold. This kind of news are really stressful for us. We fear of losing the school and our jobs. What kind of issues are you facing in your daily operation? Of course, I think that there is no place like Mongolia, where the schools work in six shifts. After School No.20 finishes its third shift, my school faces a lot of troubles. We used to have about 1,000 students, and now many of them have transferred. Children, parents and teachers are all facing hard conditions. Would you say that children's rights are being violated? Children can't enjoy their certain rights in the field of study. Officially, classes must be taught for 40 minutes but we have only about 35 minutes. Kids can't study in an appropriate and comfortable environment. The students of School No.11 of Sukhbaatar District are studying at the building of School No.31. School No.11 has approximately 600 students. The school is working in two shifts. An average class has 38 students. According to the director of the school, they have no problem teaching, but basic needs such as toilets, dining halls and facilies for students to spend free time are the issue. The new school is planned to be built through the state fund. Officials say that the selection process of the contractor was announced on August 29, 2014 and the deadline for registering ended on September 29. School No.11 is optimistic that they will have their premises built soon. School No.3 was founded in 1921 and has over 1,485 students. Since 2012, students of the school have been studying in two shifts at School No.4 and No.16. Children of primary school used to study in three shifts before, but now it has been changed to two. The following is an interview with the director of School No.3, B.Khorolgarav. Since 2012, students have been studying at different places. When was the school building originally planned to be commissioned? At the time of the agreement, I was not the director. So I have no idea about this first agreement. Officials say that the rebuilding process will be finished by September next year. At what level is the building's construction currently at? The concrete framework has been finished. The overall budget for the reconstruction of our school is 6.8 billion MNT. You said that there is no problem in teaching and studying. Are there any other issues? We are facing some trouble in developing our student's talent and abilities. In December 2013, the State Professional Inspection Agency and the National Emergency Management Agency inspected School No.14 at the report that a ceiling of the restroom on the first floor collapsed. As a result, the school was closed. Since then, the students of the school have been studying at Shavi complex, School No.92 and No.44. The director of the school refused to be interviewed and did not provide any information. School No.32 was founded in 1954 dedicated to the animal laboratory. In 1965, the laboratory was recommissioned into a school, where about 600 children of Zaisan area studied until 2013. The school was officially closed in May 2013 as a ceiling broke down due to water pipeline issues. The reconstruction of the school is estimated to cost 5.8 billion MNT and the construction work hasn't started yet. Currently around 350 students of grades one to five study at a gym premise that was built in 2009, while the students of grades six to 12 have been studying at School No.15 for the second year. Director of School No.32 G.Munkhbayar said that when he started working as the director in 2011, the school building was not up to standards. "At the moment, our students study at the lobby of School No.15. Since the teachers of School No.15 lock the doors of classes, our students and teachers have no way of working. I have made requests several times to the related departments, there was no response. The teachers of the secondary school, education manager, social workers are at School No.15, while the archive and the library are located at the gym. The ministry aims to develop every child but we have no opportunity to develop our students under these circumstances. I would like to ask authorities to resolve the inactive concession agreement and the budget problem for renewing the school building." October 28 (UB Post) The Human Rights Commission evaluated the living conditions of people with disabilities in Mongolia. Although there are 117,000 disabled people living in Mongolia, out of which over 28,000 are children, special public resources and pedestrian crossings with sensors have not yet been built for their use. A significant factor in the high number of impaired individuals living in Mongolia is traffic and industrial accidents. How can we help these disabled people? Members of parliament, administrators of the city, and state authorities have discussed helping and promoting disabled people's lives many times but have still not implemented the changes talked about. Recently constructed overpasses at Bumbugur market, 100 Ail, and a bus station at 120 Myangat have seen much better improvements for use by impaired people. These overpasses have elevators for elders, disabled people, pregnant women, and others who might struggle with mobility. The Mongolian National Association for Wheelchair Users, National Federation of the Blind, and Mongolian National Federation of the Deaf participated in designing the overpasses at Bumbugur and 100 Ail with the Ulaanbaatar Traffic Police Department. During the evaluation by the Human Rights Commission, it was identified that a special walkway with Braille for visually impaired people had not been built at the Bumbugur overpass, and that wheelchair users couldn't use the elevator by themselves, requiring assistance to reach it. For disabled people, it is hard to live, study and work in Mongolian society because accessible working and living environments are not provided. Looking at statistics from 2013, there were 54,967 male and 52,178 female disabled individuals living with visual, hearing, cognitive and speaking impairments and illnesses such as leprosy, epilepsy, and mental illness in Mongolia. As the organizers working on behalf of disabled residents said, they delivered a recommendation letter to the ministries and state administration organizations before the building of access ramps last year, but they have not been built . The organizers say that they will deliver the results of their accessibility inspection again, this time as a recommendation to the Cabinet, Parliament and relevant organizations. If the attempts of the Human Rights Commission and relevant organizations could be made effective and if state organizations implemented their recommendations, impaired people's lives in the city would improve. Undesnii Shuudan interviewed M.Chuluun-Erdene, manager at Tugeemel Khugjil Center, an NGO for people with disabilities. What other problems face impaired people besides road and transportation issues? There would not be any difficulties for people with disabilities if the road and transportation issues are resolved. Actually, because of the transportation issue, people with disabilities don't have any choice but staying at home. Another issue is to provide salaries for people who help disabled people. Undesnii Shuudan also interviewed citizen M.Tsengel, to learn about problems facing people living with disabilities. When did you become visually impaired? I used to be able to see until I was seven years old. I became blind because I did not have lens replacement surgery. Have you ever crossed the overpass at Bumbugur trade market? Yes, I have, but there was no Braille walkway for visually impaired people. For me, it's hard to cross a road and I usually receive someone's help to cross. It would be really easy if a siren was installed at pedestrian crossings. Do the companies that build overpasses listen to suggestions like this? Not really. I think it is better if the construction companies meet with impaired people and reflect what is said in building projects. October 27 (UNICEF Mongolia Blog) In a ger tent in Ulziit, horse racing capital of Mongolia, 15-year-old former child jockey Budgarav rests on his crutches and adjusts the baseball cap on his head. Four years ago he was thrown from a horse during training and trampled, losing his front teeth and breaking both his legs. "It was very painful when I fell," he says. Budgarav wasn't wearing any safety equipment and was not insured. His trainer didn't want to report the injury or take him to hospital. Instead, his legs were bound with camel wool and he was warned not to tell anybody about it. By the time he did get to see a doctor, a month later, his legs and gums had become infected and his condition was much worse. Despite his severe injuries, Budgarav is a happy and outgoing boy. He often smiles and jokes with visitors. But he cannot walk far from the ger, even on crutches, and has had to drop out of school. "Now I stay at home and watch TV," he says. "Sometimes I play outside the ger. I would like to go back to school next year if my health improves." His younger brother Munkh-Erdene, 13, is also a former child jockey. He was thrown from a horse that slipped on ice during a winter race. He wasn't wearing a helmet and landed on his head, crushing the side of his skull. Unlike his brother, Munkh-Erdene is a quiet, serious boy and still obsessed with horse racing. "I like drawing pictures of horses and listening to songs about horses," he says. "When I grow up, I want to be a horse trainer." As his injuries are less severe, Munkh-Erdene is still capable of racing, although doctors have warned him that another blow to his head could be fatal. His parents have forbidden him to race, but the horse trainers still encourage him to do it. He raced again this year without a helmet and under another boy's name. This summer, his parents sent him to stay with relatives to stop him from racing. Horse racing is a part of Mongolian culture and has been practiced for many centuries. Every midsummer, the country celebrates the Naadam festival to mark Mongolia's independence. The highlight of the festival are games featuring the 'three manly sports' of archery, horse racing and wrestling. "Horse racing is a big part of Mongolia's history and culture," Sarangerel Chuluunbat from the Federation of Mongolian Horse Racing Sport and Trainers says. "Mongolia as a nation was founded on strong men and powerful horses. I am not against children racing horses, but I know our responsibility is to ensure the safety of child jockeys." However, horse racing has changed since ancient times and become more commercialised. Now hundreds of horses and jockeys race at one time and people gamble on the outcome. Athletes in the other traditional sports are adults but jockeys are almost always children, due to their light weight. Some trainers teach children to deliberately fall from their horse on the final straight so that it comes in lighter and faster. With so many horses galloping behind them, the risk of trampling is high. As well as Naadam, wealthy families organise horse races to celebrate weddings, even during the winter months when the ground is icy and even more dangerous. In these races, the children are as young as five and rarely wear protective gear. If they are insured at all, it is usually for far less than the horses, who are considered the real stars of the show. Ulziit, where Budgarav's family lives, is where the main Naadam horse races are held. Almost all the children living or studying in the town work as child jockeys. The school is linked to the horse training centre and children are pulled out of class for up to a month to race, often without their parent's consent. Those who cannot or will not race are sent home. Budgarav's father, Otgonbaatar, does occasional labouring jobs but horse racing was the family's main source of income. Now they live on disability benefits and food coupons. The horse trainers gave the family one-off payments of 200,000 Tugriks ($108 USD) for each injured boy. "Life is hard," Otgonbaatar says. "We don't have enough to live on." The current law governing the Naadam festival states that children under seven years old cannot take part in the race, and that those who do must be insured and wear protective gear. But this law is specific to the official Naadam races and does not cover other races such as those organised by local communities to mark weddings or haircutting ceremonies. UNICEF is advocating for the law to be extended to cover all horse races in Mongolia. "We also want to ban winter races and raise the minimum age to nine, as a first step towards meeting the international standard of 14," says Amaraa Dorjsambuu, child protection specialist at UNICEF Mongolia. "It's important to acknowledge Mongolian traditions but at the same time we need to be strong on wrongdoing and prevent the exploitation of children." The situation has already improved. In recent years, the Government's National Authority for Children has worked with the Federation of Mongolian Horse Racing Sport and Trainers to monitor national races and enforce the rules on age, safety equipment and insurance. Over 1,700 children took part in this year's Naadam races in Ulaanbaatar. "You can really see the difference," Amaraa continues. "Last year, 63 children were injured and six killed during the Naadam races, but this year there were only two light injuries and no deaths." Otgonbaatar still celebrates Naadam but no longer feels the same way about horse racing. "Definitely my view of horse racing has changed," he says. "The traditions have been lost and it's all about big business. We used to have two healthy boys but now they are both disabled. If Munkh-Erdene had been wearing a helmet, he might still be OK."
Outside Ulziit a new racecourse is being built. Alongside it a massive horse statue has been raised, paid for by a wealthy horse owner. The horse is shown tossing its mane against a dramatic backdrop of steppe and mountains. Significantly, although the statue stands beside a racecourse, the horse is shown without a jockey. It is clear that much more needs to be done if child jockeys, and their rights, are to become visible in the public eye. October 28 (UB Post) The Prime Minister granted a new apartment to the parents of eight children, born in the rare case of four consecutive deliveries of twins, to celebrate the 375th anniversary of the founding of Ulaanbaatar. Father D.Enkhtur and mother Ts.Undrakh, previously residing in the 11th khoroo of Sukhbaatar District, received the key and certificate of ownership for the three-room apartment from Governor of the Capital and Mayor of Ulaanbaatar E.Bat-Uul and Chief of the Ulaanbaatar City Governor's Office Yo.Gerelchuluun, on October 27. While presenting the keys to the apartment, the Governor commented, "The state and government is paying a lot of attention and executing many projects to increase the population. To the two of you, who have eight children with four deliveries – a rare exception even in nature, I'd like to thank you on behalf of the residents of the capital. To support and ensure a comfortable life, I'm awarding you with the largest sized apartment from apartments given to city residents in need of housing. I hope you raise your children well and into residents who will contribute greatly to the city's development." D.Enkhtur's family will be moving to the 81 cubic meter apartment at Building 32A of Chukhag Town in 27th khoroo, Songinokhairkhan District. "I'm very grateful to the Governor of the Capital, who awarded my family with this apartment, and the President of Mongolia, who initiated this," said D.Enkhtur. With only a few brush strokes of Mongolian calligraphic script the rich history, tradition, culture and intellectual heritage of the country's nomadic shepherds becomes apparent. In 2003 UNESCO listed it as an Intangible Cultural Heritage in Need of Urgent Safeguarding. One of the earliest examples of Mongolian calligraphy is the Genghis Stone. Measuring over two metres in height and dating back to the 13th century the five-line inscription recounts the deeds of Genghis Khan. In 1818 the Russian scientist G.S. Spassky discovered the stone in western Mongolia near the Kharkhiraa River in Uvs Province. In 1932 the Genghis Stone was taken to St. Petersburg and since then has been on display in the State Hermitage Museum. According to D. Batbayar, "This is the most valuable possession representing our cultural heritage and the source of our nomadic philosophy." After years of suppression, during the period of democratisation Mongolian calligraphy experienced a renaissance in the 1990s. 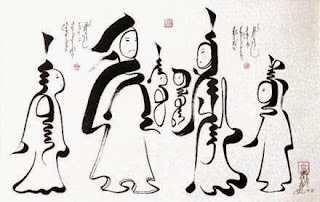 Since that time the famous Mongolian calligrapher has researched the art of poetical handwriting which, in order to create words, uses letters conjoined vertically by a continuous line. His book entitled 'Opaque Writing of Short Life', which he published in 2013, illustrates the importance of calligraphy in the development of Mongolian literature. "There are many wonderful works by famous Mongolian researchers and authors", says Batbayar. "Mongolian handwriting is unique, moving upwards on the page and from right to left ", says the calligrapher L. Tuvshinjargal. "It is an expression of the energy from the sky that comes down to Earth. We want our children to keep the beautiful art of Mongolian calligraphy alive by encouraging them to learn handwriting skills." Since 1997 a competition has been held enabling children from the age of six to present their work. The history and secret of the rare art of poetic handwriting are evident at the International Festival of Calligraphy in Ulaanbaatar. Every year on the first Sunday in May the Mongolian capital plays host to competitions and displays on the topic of 'Script and Culture'. This year over 64 works from 40 calligraphers went on show, including from many young artists. P. Tsagaan, the Mongolian president's chief of staff, opened the seven-day festival with the following words: "Throughout the millennia Mongolian script has kept the history and culture of the Mongolian nation alive. That is something we are proud of. Today we see that it also brings the people of Mongolia closer together. We have exhibitors here both from Buryatia and Central Mongolia. That is the real wonder of Mongolian calligraphy." Readers interested in exploring Mongolia's history are recommended to visit the National History Museum and the Mongolian National Modern Art Gallery in Ulaanbaatar. For general information and the latest on special exhibitions please visit: http://eng.art-gallery.mn or www.nationalmuseum.mn. October 21 (Royal Roads University) Marc Tasse is among Royal Roads graduates helping Mongolia take its place in the world. For the last two years, the Master of Global Management alumnus has been resident director of the American Center for Mongolian Studies (ACMS) in the country's capital, Ulaanbaatar. The centre, which is celebrating its 10th year, is a hub of academic study in the Central Asian country, which has rapidly developed since the fall of communism and its democratic revolution in 1990. For Tasse, the role was a chance to put new skills and knowledge acquired at Royal Roads to the test internationally. "I had a background in business development, both the private and non-profit sector," he says. "I wanted a position that permitted me to use my administrative, project management and business skills in a new and challenging way." As resident director, Tasse is responsible for running the ACMS, overseeing its projects, training staff, including seven fulltime Mongolian employees, developing programs, and exploring new funding sources and research. Royal Roads Associate Prof. Charles Krusekopf, founder and executive director of the ACMS, says the centre has more than 300 student and scholar members. More than $2.4 million in support has been provided to Mongolian studies programs through the centre, including field research and exchange fellowships. Notably, the centre boasts a 4,000 book research library, the largest English language library in the country, which is available for Mongolian people and visiting scholars to use. "The ACMS plays a key role in building knowledge about Mongolia in the world, and in bringing the world of knowledge to Mongolia," Krusekopf says. "We're like the home away from home for international researchers in Mongolia." Besides the work Tasse is undertaking, six Royal Roads students are on internships this fall in Mongolia to support small and medium enterprise suppliers to the Oyu Tolgoi copper mine. They're the second group to travel to Mongolia as consultants through an agreement signed in October 2013 between Royal Roads and Oyu Tolgoi LLC, the company developing a mine on one of the world's largest copper-gold resources. Krusekopf says although most news about Mongolia focuses on the country's vast mineral resources, the ACMS is multidisciplinary, helping support researchers in the sciences, environment, humanities and social sciences, as well as the mining sector. Royal Roads, Krusekopf says, is continuing to look at new ways to strengthen its relationship with Mongolia. As example of the broad work ACMS does, Tasse is working on two major research projects in partnership with Mongolia's Ministry of Culture, Tourism and Sport, including modernizing the Mongolia public library system and training staff at 450 public libraries. The other project is in partnership with government and the Smithsonian Institute to develop an archaeological database of information for archaeological sites, museum artefact collections and archived material. For Tasse, Mongolia is a unique and fascinating place. "In many ways it is the perfect living laboratory for all kinds of research," he says. "The quick pace of modernization and change allows economists, anthropologists and social scientists to see developments in a country that normally take decades, evolve in years within Mongolia." Tasse says the ACMS is a bridge between expatriates and Mongolians, one that will continue to play an important role as Mongolia develops in coming years. October 24 (LiveScience) Remains of a 750-year-old city, founded by the descendents of Genghis Khan, have been unearthed along the Volga River in Russia. The city's name was Ukek and it was founded just a few decades after Genghis Khan died in 1227. After the great conqueror's death his empire split apart and his grandson Batu Khan, who lived from 1205 to 1255, founded the Golden Horde (also called the Kipchak Khanate). The Golden Horde kingdom stretched from Eastern Europe to Central Asia and controlled many of the Silk Road trade routes that connected China to Medieval Europe. "Some items belonging to local elite were found in the Christian district," Dmitriy Kubankin, an archaeologist with the Saratov Regional Museum of Local Lore, told Live Science in an email. "Among other things, there is a Chinese glass hair pin, with a head shaped as a split pomegranate, and a fragment of a bone plate with a carved dragon image." One of the temples was built around 1280 and was destroyed in the early 14th century. "It was roofed with tiles and decorated with murals and stone carving[s], both, from the outside and inside," Kubankin said. "Nevertheless, digging just in one site may lead to significant discoveries. Archaeological expeditions from the Saratov Regional Museum of Local Lore [have made] yearly excavations since 2005," said Kubankin, adding that these discoveries will soon be featured in a museum exhibition. October 27 (The Yomiuri Shimbun) What is a runner-up finish with 13 wins in a wrestler's debut in the uppermost makuuchi division worth? For sumo's newest star Ichinojo, it means being catapulted to the sport's third-highest rank for the upcoming Kyushu Grand Tournament. Ichinojo finished second to yokozuna Hakuho at the Autumn tournament last month in Tokyo as a No. 10 maegashira, and was fast-tracked past komusubi and inserted as a sekiwake in the rankings announced Monday by the Japan Sumo Association for the tournament to start Nov. 9 at Fukuoka Kokusai Center. Ichinojo, whose hair has finally grown long enough for a topknot, had the fastest rise into the sanyaku — the three ranks below yokozuna — since the start of the Showa era in 1926, needing just five tournaments since turning pro. It also marks just the third time in that time span that a wrestler has earned promotion to the sanyaku in the tournament following his first appearance in the makuuchi division. The others to do so were Kitanofuji and Onishiki. Hakuho heads the rankings as the yokozuna on the east side, coming off a 31st career title at the Tokyo tournament that tied him with legendary yokozuna Chiyonofuji for second on the all-time list. In Fukuoka, Hakuho will take aim at equaling Taiho's all-time record of 32. "Nobody knows what will happen until it happens, but I'd like to [tie the record] before the end of the year," Hakuho said at a press conference at his stable's lodgings. Bulgarian Aoiyama fills the other sekiwake spot after compiling a 10-5 record as No. 3 maegashira, while Takekaze dropped from sekiwake to komusubi, where he is joined by Ikioi, who was promoted from No. 5 maegashira. Russian Amuuru is the lone newcomer to the makuuchi division, installed at No. 14 maegashira, while Tochinoshin returns at No. 8 after winning the juryo title with a perfect 15-0 record. HOHHOT, Oct. 28 (Xinhua) -- An engineer form north China's Inner Mongolian Autonomous Region has developed a program to translate Chinese into Mongolian. "My intention was to improve the accuracy of translation," said Ilichi, 32, an ethnic Mongolian who developed the freeware, which can be easily accessed online. China has just under 6 million ethnic Mongolians, with more than 4 million using Mongolian as their everyday language. To protect the language, regional law requires that all government institutions, all businesses and shops, in the region use both Chinese and Mongolian in public. Many of the mongolian words people see on the street, however, are simply wrong: bad translations from their Chinese counterparts, or vice versa. "My major in college was computer science and I wanted to design a program to accurately translate Chinese into Mongolian," said Ilichi. The software he designed for both computers and smartphones has filled a gap in the market. "I've tried the software on many texts and the translations the program provides are quite satisfactory," said Balaji Nyima, an ethnic mongolian linguist who has been working with the language for more than 20 years. His expert opinion is echoed by another 30,000 mainstream users of the program. Ilichi claims there are nearly 500,000 words in the database, "I thought very carefully about the grammar of Mongolian when writing the code, to try to increase the accuracy of the translation," he said. Ilichi reads a large amount of linguistic and historical theories. "For example, the spelling of a word is quite different when it appears in the middle or at the end of a sentence. I spent several days working on this single function, and I've learned a lot during the process. It's been an enriching experience for me." Ilichi has been trying to start his own business since graduating from Inner Mongolia Normal University in 2005, developing the translation software and working as a translator at the same time. He is still working on improvements to the software, and plans similar programs to translate Chinese into Manchu and Korean. "The program only brings me an annual income of about 50,000 yuan (about 8,000 U.S.dollars) to 60,000 yuan, but the costs of development and maintenance of the program run to more than 100,000 yuan a year," he said. His biggest challenge now lies in finance. "Although it may only serve the needs of a small group of people, it is a job that has to be done. It is the only way we can preserve our ethnic minority languages in a new technological era," Ilichi added.